The entire website is searchable from the search window displayed in the banner masthead at the top of every page. 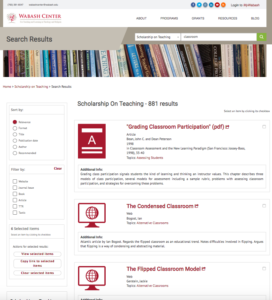 Wabash Programs – includes all the pages that describe the various activities, projects, and programs sponsored by the Wabash Center. 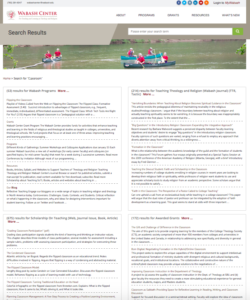 The rest of the “Content Types” display a library of resources to support teachers. .
Click on the Content Type’s label to see the full List of Search Results for that content type. Click on “more” or “details” to see full text of blogs and book reviews, and table of contents of books in our collection (we are a non-circulating library). Click on a topic or tag to see more records with that topic or tag. 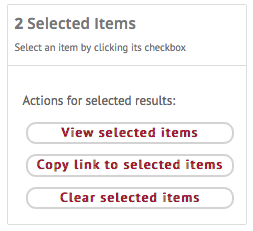 “Clear Selected Items” – unchecks all boxes. Options to “Sort by” and “Filter by” vary by Content Type. Modify your search terms in the search window displayed int he banner masthead at the top of the page. Search finds the exact word or phrase typed into the search box. There is no truncation or Boolean search capabilities.